In the competition between mid-market accounting and ERP packages, the glamour might fall a little bit short of the Academy Awards. Yet for four years in a row, Intacct, now known as Sage Intacct, has basically been Tom Hanks, pulling in rave reviews from critics and generating great box office at the same time. As it enters its twentieth year, Sage Intacct is at the top of the field, earning a 98 score out of 100 in the most recent G2 Crowd Grid for Mid-market Accounting. There’s no ERP that’s higher rated, and that matters a lot because much of the ranking is based on reviews by customers who are using the software every day. G2 Crowd uses the ratings of users as well as market factors to segment products into Niche, Contenders, High Performers, and Leaders quadrants. Sage Intacct’s closest competitor in customer satisfaction is Quickbooks Pro Desktop, but as the name says, QB Pro is a desktop software, not well-suited for running multi-location, multi-entity enterprises and also not easily shared by more than one user. For those reasons, QB Pro best serves a limited range of the middle market. Quickbooks Online, while a cloud application, falls further back in customer satisfaction and lacks the speed and many features required by mid-market companies and nonprofits. Among true cloud applications, Oracle Netsuite is also in the Leaders quadrant, but despite its very large footprint in the market, Netsuite doesn’t get close to Sage Intacct’s customer ratings. Other well-known cloud ERPs fell further back, including Financial Force and Acumatica, which lag in both customer satisfaction and in market presence. Digging into the customer reviews, we see that inflexible reporting and workflows have a negative impact on these products. It’s no surprise then that Sage Intacct comes out ahead, as flexible reporting, role-based dashboards, and tailored workflows are some of its big strengths. Not surprisingly, ERP giants Oracle EBS, Oracle PeopleSoft, and SAP all fall far back in serving the mid-market. These massive suites cost many times what Sage Intacct does, require substantial infrastructure on the customer’s end, and take months and sometimes over a year to implement. Although they’re very powerful, that power translates to cumbersome processes for smaller organizations. In contrast, Sage Intacct is a pure cloud application and can be implemented in weeks instead of months. And because of its subscription model, it can be scaled as needed for growth, without requiring expensive upgrade processes or reimplementation to take an organization from startup to enterprise. If G2 Crowd’s rankings aren’t enough, the American Institute of CPAs has renewed their selection of Sage Intacct as the preferred provider of financial solutions. That doesn’t even need to be certified by PwC before Warren Beatty opens the envelope. 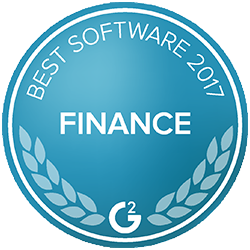 Learn more about G2 Crowd's Grid Scoring and tell us about what matters to you in ERP applications.